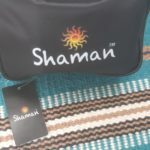 In my upcoming natural beauty class, I will be showcasing essential oils from Shaman® Oils. As part of the class, each student will receive a kit with (5) 10ml bottles of essential oils, including Lavender and Frankincense plus other that have a strong affinity to the skin. Additionally, each participant will receive a gorgeous Rose Damascus Hydrosol to aid and restore the skin’s natural beauty. Details on the Natural Beauty Class are below. Price: $275.00 for the workshop. What’s included: Each participant receives a $150.00 (retail value) kit to take home with vital essential oils for the skin. Kit Price is included in class fees. How to create 3 custom natural beauty products –Facial Serum, Body Scrub, and a Body Lotion. 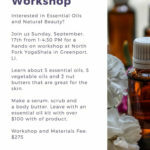 Each participant will leave with their own therapeutic skin care products, made under the guidance of a clinical aromatherapist–a $75.00 value! Plus you’ll receive an instruction booklet, and the hands-on and how-to instructions required in order to continue the beautiful aromatic journey in your home! A new venture from a company with over a 30-year history in the field of essential oils, their traceable and transparent supply-chain ensures a sustainable system that supports the soil, the seed cultivators, farmers, distillers, and workers. With Distilleries located in Turkey, Egypt, Albania, Brazil, Ukraine, Morocco, India and the United States (New Jersey), they’ve traveled the world to bring these essential oils from the farm to your door step–all with a minimal carbon footprint. Reduced Fuel Consumption: In order to reduce fuel consumption, we’ve tapped into natural underground freshwater springs, and all water treatment is conducted on site. Energy Conservation: Solar panels are used for energy from housing to water pumps. Water conservation: Water is regulated through delicate humidity sensors in the soil. Carbon Footprint Reduction: Housing for employees and their families has been provided on premise reducing our carbon footprint. Sustainable Food Resources: Families that manage the farms also grow their own vegetables and care for the livestock for food and dairy. Green Cleaning: All cleaning on premise is done without the use of chemicals or harsh detergents, thereby not contaminating the land. Reduction of Food Scarcity: We’ve leased over 10,000 acres from the Ukrainian government and have supported the local community in many ways. We are currently growing vegetables to aid the community while reserving over 2,500 acres for organic farming. 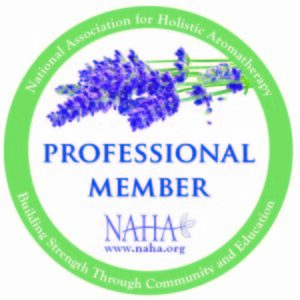 As the Northfork Yogashala hosts additional aromatherapy workshop, I will continue to highlight her favorite distillers and regional experts. I am super excited for my upcoming Essential Oils from Native Plant of the USA Workshop and I will be featuring gorgeous essential oils from the American Southwest. We are excited for you to join us on Sunday, September 17th, and experience the profound blessing of nature.